Rethinking Carbon-14 Dating: What Does It Really Tell Us about the Age of the Earth? Cosmic rays (mainly high-energy protons) trigger a process in the atmosphere that changes atmospheric nitrogen into 14C. However, unlike the other two carbon isotopes, 14C is unstable and eventually decays back into nitrogen. The decay rate can be measured for a large number of these 14C atoms. 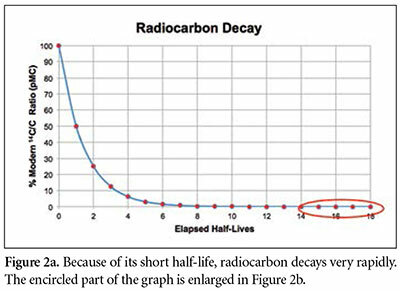 Since this decay process slows as the number of 14C atoms decreases, it may be expressed best in terms of a half-life, which is the amount of time for half of any given sample of 14C to decay back into nitrogen. Thus, after one half-life, 50 percent of the original 14C atoms will remain. After two half-lives, 25 percent of the original 14C will remain, and so on. Today’s measured half-life of 14C is 5,730 years. Sensitive instruments called acceleration mass spectrometers (AMS) are used to count the 14C atoms within a sample of material. 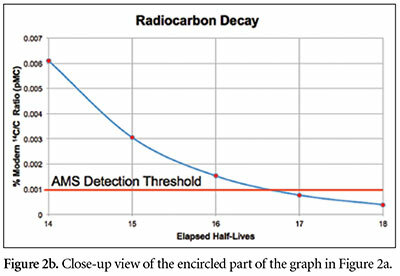 However, even the most sensitive AMS machines cannot detect fewer than one 14C atom per 100,000 trillion carbon atoms.1 Since the amount of 14C in a sample decreases with time, no radiocarbon at all should be detectable if the sample is sufficiently old. Assuming the initial value was 100 pMC, how much time will have transpired before the 14C/C ratio in a sample drops below 0.001 pMC? Evolutionists have attempted to blame these surprising results on a number of mechanisms.3 They often invoke “contamination” that occurred either in situ (on site in the earth) or during the radiocarbon testing process itself. However, the consistency with which 14C is found in these samples makes it difficult to argue that such results are all the result of in situ contamination. Moreover, diamond is extremely resistant to “natural” contamination by external 14C atoms. Interestingly, however, some radioisotope methods tend to consistently yield younger age estimates than others, even when the techniques are used on the same rock units.4 Could this be a clue that radioisotope “clocks” might have “ticked” at different rates in the past, and that this variation in “ticking” is different for different radioisotopes? 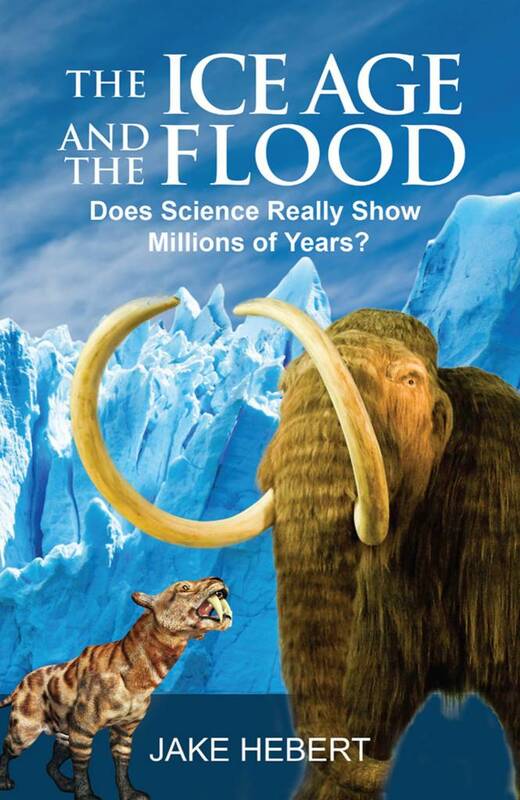 Virtually all fossils found within sedimentary rocks are the remains of creatures that perished during the Genesis Flood about 4,500 years ago. Yet a skeptic might point out that the amounts of 14C found in these organic samples are smaller than what one might expect if they are only about 4,500 years old. And 4,500 years is less than one radiocarbon half-life, so from Figure 2 we might expect 4,500-year-old samples to have 14C/C concentrations greater than 50 pMC. Yet the 14C found within organic samples thought to date from the time of the Flood is generally only about 0.1 to 0.5 pMC. 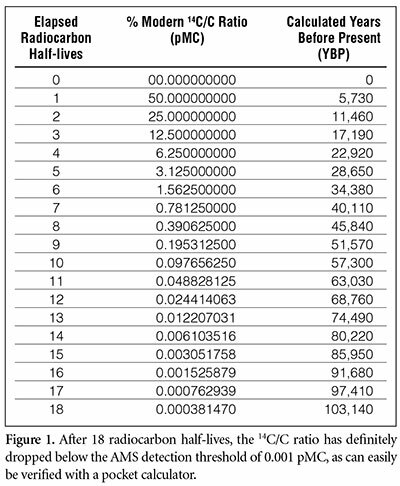 From Figure 1, a value of 0.098 ≈ 0.1 pMC corresponds to 10 half-lives, or about 57,000 years. 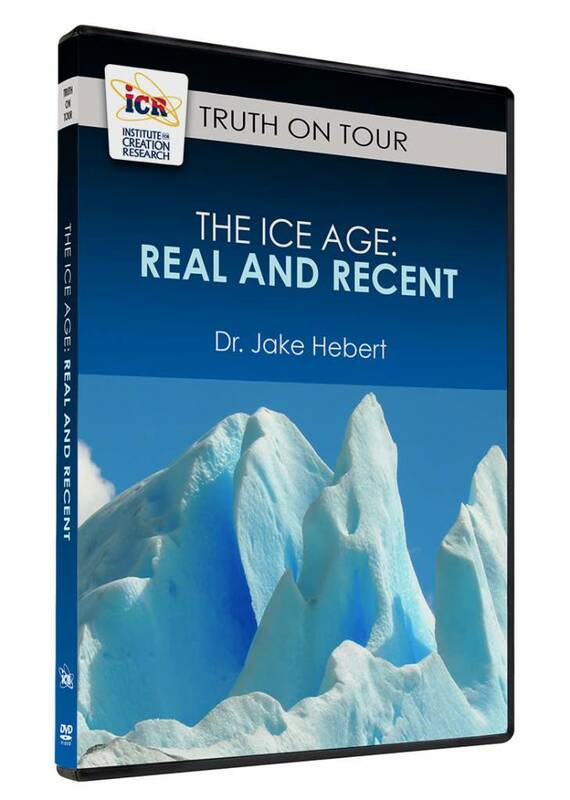 Are these high radiocarbon “ages” a problem for the biblical worldview? Thus, these “inflated” ages are not a problem for the biblical creationist, but the presence of detectable 14C in supposedly ancient organic specimens is a substantial problem for those who believe in an old earth. In scientific notation, 100,000 trillion is 1017. For technical details of the information in this article, see Baumgardner, J. 2005. Carbon-14 Evidence for a Recent Global Flood and a Young Earth. In Radioisotopes and the Age of the Earth: Results of a Young-Earth Creationist Research Initiative. Vardiman, L., A. A. Snelling, and E. F. Chaffin, eds. San Diego, CA: Institute for Creation Research and Chino Valley, AZ: Creation Research Society, 587-630. For example, evolutionists have attempted to explain that the 14C present in diamonds was caused by thermal neutrons within the earth’s interior. However, calculations show that this explanation doesn’t work (Radioisotopes and the Age of the Earth: Results of a Young-Earth Creationist Research Initiative, 614-616). Snelling, A. A. 2010. Radiometric Dating: Making Sense of the Patterns. Answers. 5 (1): 72-75. See chapters 2, 3, 4, and 7 in Radioisotopes and the Age of the Earth: Results of a Young-Earth Creationist Research Initiative. One apparent problem with episodes of accelerated nuclear decay is the enormous amounts of heat that would be generated—heat that would seemingly be fatal to life on earth. Since an alteration of nuclear decay rates may have been a miracle, God could have supernaturally dissipated this excess heat, and one respected creation physicist has proposed a mechanism for this. See Russell Humphreys’ discussion in Vardiman, L., A. A. Snelling, and E. F. Chaffin, eds. 2000. Radioisotopes and the Age of the Earth: A Young-Earth Creationist Research Initiative. 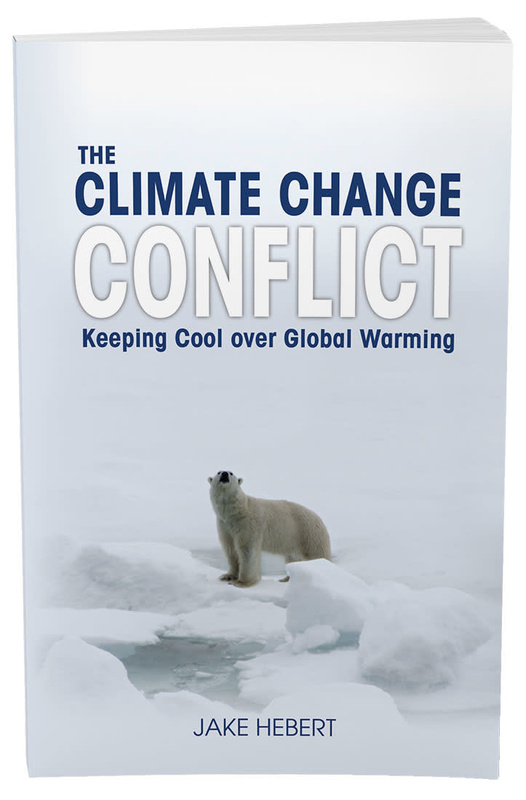 San Diego, CA: Institute for Creation Research and Chino Valley, AZ: Creation Research Society, 369-373. Creationists believe that this accelerated nuclear decay likely occurred early in the creation week and during the Flood. 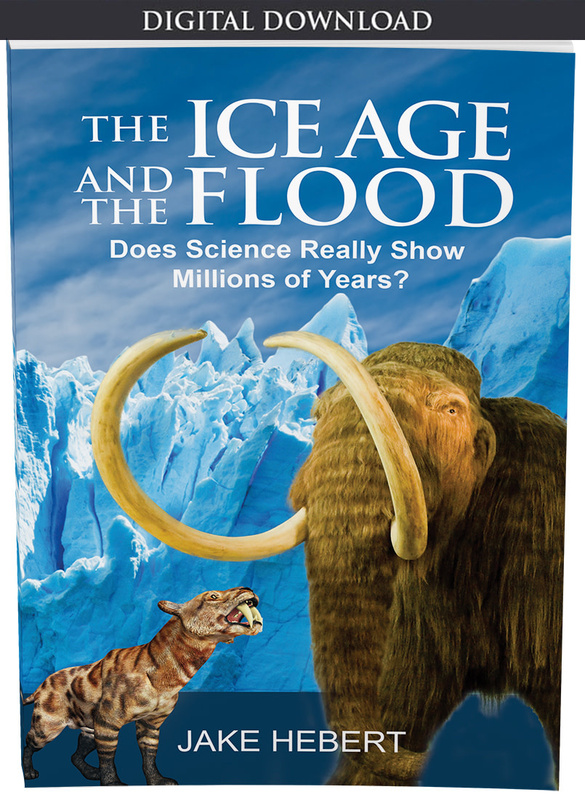 See Radioisotopes and the Age of the Earth: A Young-Earth Creationist Research Initiative, and Radioisotopes and the Age of the Earth: Results of a Young-Earth Creationist Research Initiative. Radioisotopes and the Age of the Earth: Results of a Young-Earth Creationist Research Initiative, 617-620. Cite this article: Hebert, J. 2013. Rethinking Carbon-14 Dating: What Does It Really Tell Us about the Age of the Earth? Acts & Facts. 42 (4): 12-14.